d) Construction of two commercial complexes in the “buffer zone”. Reactive Monitoring mission in September 2003; UNESCO-Rabat mission in February 2005; Joint World Heritage Centre-ICOMOS Reactive Monitoring mission in April 2006. As requested by the Committee, the State Party submitted a report, dated 25 January 2006, providing information about progress made in improving conservation and management of the property. The authorities of the Municipality, the Province and the external services of the Ministerial Departments represented in Essaouira have been engaged, under supervision of the Prime Minister, in the sensitization and relocation of approximately two-thirds of the inhabitants of the Mellah, one of the historic quarters of the Medina of Essaouira, to new residences outside the historic city. These authorities have initiated a comprehensive study of the rehabilitation and restoration of the Mellah and its Atlantic wall (under implementation by the Ministry of Housing), as well as multiple clean-up actions, a partial restoration of the wall (the interior façade at Bab Doukkala) and pavement and lighting of the Rue Mellah. Terms of Reference have been established for a comprehensive study for the protection of the Atlantic wall of the Medina against the action of the sea. The report also described two new construction projects, the first next to Bab Sbâa and the second opposite Bab Doukkala, in the buffer zone of the World Heritage property, already initiated prior to inscription. The projects, both in their final phase were primarily intended to enhance public spaces that had been in a state of abandonment for several years. The Ministry of Culture had guided discussions to ensure a proper integration of the two projects into their cultural-historic environment. The World Heritage Centre and ICOMOS undertook a reactive monitoring mission to review implementation of the decisions of the World Heritage Committee and to evaluate the state of conservation of the property, as well as the new projects in the buffer zone of the protected property. The mission took place from 26 to 29 April 2006. The mission noted that the overall state of conservation of the Medina of Essaouira was fairly good and had improved in recent years, in particular due to the recent clean-up and demolition of ruinous structures in the Mellah, which had constituted health and safety hazards. The mission was able to draw comparisons with an earlier visit (1998) where formerly a totally ruined and slum-type of neighbourhood existed against the Atlantic wall, the area was now clean and full of tourists following the trail through the historic quarters of Essaouira. Artisanal workshops, new hotels and restaurants were bringing investment, trade and activity to this part of town. Other areas in this district were earmarked for demolition, although the mission was re-assured that only those structures beyond repair would be involved and that the best and most valuable structures together with the traditional street-plan of the Mellah would be maintained. The mission stressed the need for a proper balance regarding investment in new hotels and restaurants and the traditional residential function, as well as for documentation of those structures and parts of the Mellah earmarked for demolition. The mission was of the opinion that the municipality had entered into a very challenging process that would require vigilance and constant monitoring. The section of the city now demolished requires careful planning to introduce high-quality, contemporary architectural design interventions, which at the same time preserve memory and spirit of place. There is a need for a delicate balance between old and new to ensure designs both sensitive to the cultural-historic character of the place, as well as a creative and imaginative continuation of Moroccan architectural culture. As regards the two new construction projects, both located in the designated buffer zone, the mission noted two points. Firstly, although land purchase and permission for the projects were obtained prior to World Heritage inscription, the mission regretted that these projects were not brought to the attention of the World Heritage Centre for information and advice, in conformity with the Operational Guidelines. Secondly the projects enhanced, to a great extent, the public spaces in respect of their revitalization, amenity and accessibility to local residents and visitors. The project located next to Bab Sbaa to the south of the Great Mosque Ben Youssef is of modern design, one story in height and of appropriate proportion, reflecting the surrounding cultural-historic features. Part of the project had involved the design of a large paved area in front of the Mosque and city wall, with green spaces and good access for full use by local residents. The mission felt that, despite its location in the buffer zone so close to the city wall, this solution represented a substantial improvement over the previous situation. The project located outside Bab Doukkala was still under construction and the mission noted two concerns, both shared by local professionals: height and proportion did not follow the historic fabric, while the design was of questionable quality. There were however, collateral improvements connected to this project: the public space and adjoining city wall are to be improved considerably, while economic revitalisation would greatly benefit this part of town. 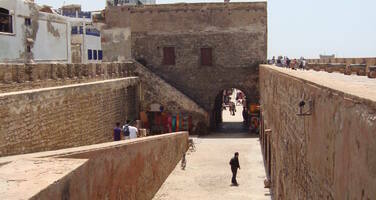 From a town planning point of view, the location of the project (constituting 80 residential and 62 commercial units) is ideal, in creating a pole opposite the existing economic and touristic centre located around Bab El Menzeh – thus establishing an economic and cultural axis through the Medina of Essaouira. Despite these relatively positive impacts, the mission stressed the necessity of respecting the buffer zone and ensuring that no future incompatible construction projects are carried out in this area. 8. Requests the State Party to provide the World Heritage Centre with an updated report, by 1 February 2008, on the state of conservation of the property and progress in the restoration, rehabilitation and redesign of the Mellah Quarter with its Atlantic wall, based on an integrated approach within a site management plan, for examination by the World Heritage Committee at its 32nd session in 2008. 7. Requeststhe State Party to provide the World Heritage Centre with an updated report, by 1 February 2008, on the state of conservation of the property and progress in the restoration, rehabilitation and redesign of the Mellah Quarter with its Atlantic wall, based on an integrated approach within a site management plan, for examination by the World Heritage Committee at its 32nd session in 2008.